North Lanarkshire and South Lanarkshire have a joint board for valuation and electoral registration. There is also a joint health board, which does not cover Rutherglen and the surrounding area in South Lanarkshire. 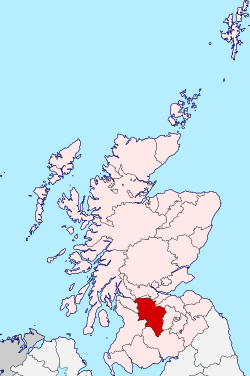 Without the northern portion of North Lanarkshire, this is also a Lieutenancy area. 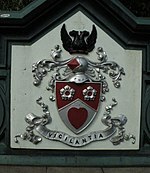 Lanarkshire's arms, as seen on the Great Western Bridge in Glasgow. Lanarkshire was granted a coat of arms by the Lord Lyon on 24 December 1886. The arms is: Party per chevron gules and argent, two cinquefoils pierced in chief ermine, and in base a man's heart counter-changed. The cinquefoils come from the arms of the Clan Hamilton, and the heart from the arms of the Clan Douglas, the two main local families. The crest is a demi-eagle displayed with two heads, sable beaked gules. The motto is VIGILANTIA. From the mid-eighteenth century to the early twentieth century Lanarkshire profited from its rich seams of coal in places such as Glenboig. As the coal industry developed around Glasgow in the 1700s the price of coal to the city rose under the control of a cartel of coal owners. The solution was to carve out a canal to take advantage of the good (and uncontrolled) coal deposits of the Monklands area. By 1793, the Monklands canal was completed and the Lanarkshire coal industry thrived. The resulting boom lasted for over 100 years but reached its peak by the second decade of the twentieth century and even two world wars failed to halt the contraction. Output in the county continued to fall and the National Coal Board concentrated investment in Ayrshire, Fife and the Lothians. By 1970 there were only four collieries left in Lanarkshire and the closure of Cardowan in 1983 brought the long decline to an end. Lanarkshire hosted the International Children's Games in August 2011. A total of 1,300 competitors and coaches, along with administrators and delegates, representing 77 cities from 33 countries worldwide attended. Wikimedia Commons has media related to Lanarkshire. 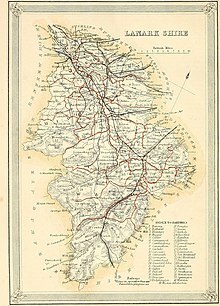 ^ "Historical perspective for Old County of Lanarkshire". Scottish-places.info. Retrieved 12 November 2012. ^ a b "Lanarkshire Scotland". A Vision of Britain through Time. Retrieved 15 August 2018 – via University of Portsmouth. ^ "Lanarkshire". Heraldry of the World. Retrieved 17 December 2017. ^ Hutton, Guthrie. Lanarkshire's Mining Legacy. Catrine: Stenlake Publishing. p. 3. ISBN 9781840336061. ^ Hutton, Guthrie. Lanarkshire's Mining Legacy. Catrine: Stenlake Publishing. pp. 3, 4. ISBN 9781840336061. ^ "International Children's Games Lanarkshire 2011". Icg-lanarkshire2011.com. Retrieved 12 November 2012.